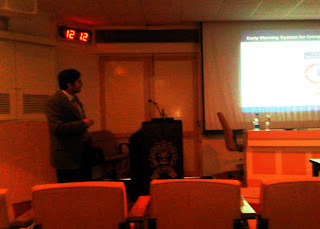 Shailesh J. Mehta school of Management was witness to a talk on Intellectual property and innovation strategy by Dr. Sudeep Basu on 6th February 2012. Dr. Sudeep Basu is a member of global consulting practice at Frost & Sullivan in the Mountain View office, CA, USA. His interests include intellectual property, technology management, and business strategy. He is an inventor on patents while having published several peer reviewed journal and conference articles. Dr. Basu also volunteers for BayBio and is an active member of the Silicon Valley chapter of The Indus Entrepreneurs (TIE). 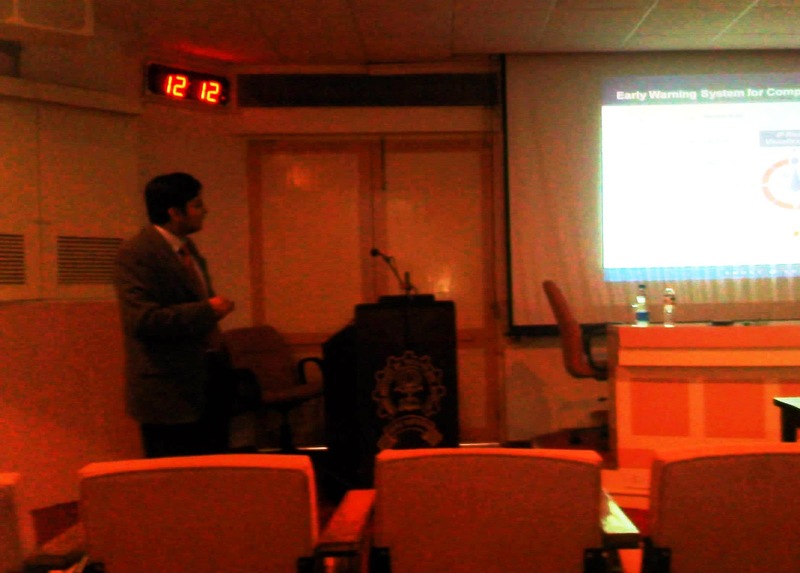 He was an AHA Pre-doctoral fellow at the Brown Cancer Research Center and is an alumnus of the Indian Institute of Technology (IIT) Bombay. His talk was focussed on strategic growth and Intellectual Property (IP) in a competitive environment, IP business intelligence for strategy and planning and IP risk mitigation. He started his talk with explaining the effect of IP on growth processes such as Mergers & Acquisitions, geographical expansions, new product developments, comparative strategies, new product launches, strategic planning, distribution channel, optimization, new customer application and marketing strategy. He explained that IP has an important role in more than 80% of these processes. He further explained the importance of IP Business Intelligence (BI) in strategic decision plans such as investment decisions, commercialization, R&D & Technology transfer, competitive strategy and positioning. With the help of porter’s 5 forces, he illustrated the effect of IP in new competitive barriers citing references from smartphone companies (threat of substitutes), Iron ore industry( increase in supplier power), Pharma Biotech industry (patent and innovation issues, threat of new entrants) as well as intense rivalry among companies, the protectionist approach etc. He also explained how expirations of Pharma-Biotech patents hurt the industry and how USPTO’s move from first-to-invent to first-to-file will impact industry patent scenario. He also gave examples of the new patent pool shifting from developed economies to developing economies such as China. His opinion was that once companies know that their patents are about to expire, they should channelize their energy into innovation strategy instead of concentration on a protectionist approach. He cited various examples from the industry like Arcellor Mittal vs Vestalpine, the Eli Lilly Deal, Kodak vs Samsung etc. He mentioned that firms go for acquisitions of entire companies just to get hold of patents. He referred to Google’s acquisition of Motorola Mobility for its patent portfolio. He also mentioned that most of the IP cases revolve around patent infringement, licensing deals and pay for delay. He also noted that practices adopted by companies such as Emergent Ventures, whose prime source of revenue is licensing deal, is unethical but totally legal. He demonstrated threat impact timeline for IP related issues. He mentioned that risk impact is imminent and high in first two months and it slowly fades in 5-10 months. He stressed on an early warning system for competitive intelligence. Focussing on IP policy and global trends, he cited the example of clean coal technology. USA, Russia, India and China have the largest coal reserves but technology patents are highest in Japan, China and the US respectively. A surprisingly large number of scientists and researchers associated in this technology are from China. Through this example, he stressed on the need of aligning national need with technology and IP strength. He cited coal as a critical energy factor. He concluded his talk after suggesting four policy recommendations for improving IP awareness and building an IP culture in India. They are viz. Intellectual Property is the result of many business innovations and creative thinking. And so coming up with solutions and strategies will be of great help for inventors. Science in a broad sense existed before the modern era, and in many historical civilizations, but modern science is so distinct in its approach and successful in its results that it now defines what science is in the strictest sense of the term. Thanks. Something like this should be always done for the benefit of people who truly cares for their intellectual property! Along with the disputes between Samsung and Apple this past few months, a trademark lawyer nyc's duty is as important as the life of your brain. Srsly.